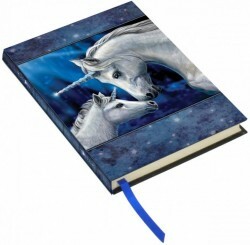 Attractive hardback writing book/journal with artwork designed by Lisa Parker. Record your thoughts, to do lists and dreams in this attractive writing book. The journal measures approximately 17.5cm high x 12.5cm wide. It contains 80 blank, unlined leaves (160 pages front and back) made from acid-free, sustainable forest paper, and includes a satin ribbon marker.